Lateran, the name of a palace and church in Rome, so called from their being built on the estate of Plautius Lateranus, who was put to death by Nero for complicity in the conspiracy of the Pisos. The palace, whose magnificence is celebrated by Juvenal, having become imperial property, a portion of it was given by the emperor Maximian to his daughter Fausta, the second wife of Constantine. This portion, called Domus Faustce, was given by Constantine to Pope Melchiades in 312, and afterward confirmed to St. Sylvester. It became the residence of the popes till their removal to Avignon (1309); it was burned at that epoch, and rebuilt in 1585. Remaining unoccupied, it was converted into an orphan asylum in 1693, and in 1843 became a depository for works of art for which no room could be found in the Vatican. To this museum Pius IX. added another for works of Christian art. The only remains preserved of the ancient palace after the lire of 1308 are on the north side of the basilica, under a magnificent portico by Fontana. They are: the private papal chapel built by Leo III., the end wall of the banqueting hall or triclinium, and the santa scala, or holy staircase. This is behind the triclinium, and is said to be the staircase of the house of Pilate, ascended and descended by Christ. The tradition is that it was brought from Jerusalem by Helena, mother of Constantine the Great. It was injured and partly cast down by the earthquake of 896, reerected in the old Lateran palace, left uninjured by the fire, and removed to its present site in 1585. It is composed of 28 marble steps, covered by order of Clement XII. with a casing of wood, which has been repeatedly worn out by the knees of ascending pilgrims. There is no day on which persons may not be seen creeping up on their knees; but in Holy Week, and particularly on Good Friday, they are covered with the multitude of penitents. At the foot of the stairs are fine sculptures of Giacometti, placed there by Pius IX., and representing the Ecce Homo and the " Kiss of Judas." On each side is a parallel flight of stairs by which the pilgrims descend. The santa scala leads up to the chapel of Leo III., called the sancta sanctorum, in which none but the pope can officiate, which no woman can enter, and which is never open to others except on the morning of Palm Sunday. The altar is in a recess, surmounted by a beautiful silver tabernacle, the gift of Innocent III. In this tabernacle is a famous painting (called Acheirotopeton) attributed to St. Luke, placed in the chapel by Stephen III. in 753, and said to be an exact likeness of Christ at the age of 12. Outside of the santa scala, to the south, is a tribune erected to receive the mosaics which formerly covered the face of the triclinium. The originals, injured by the fire, are in the Vatican; but copies made by order of Benedict XIV. represent the mission of the apostles, Christ delivering the keys to St. Sylvester and the labarum to Constantine, and Peter bestowing on Leo III. the pallium and on Charlemagne a banner. 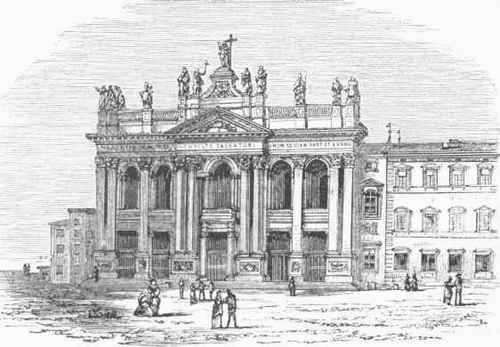 - A basilica, or hall of justice, adjoining the Lateran palace, was, according to some, assigned by Constantine for Christian worship; but according to others, Constantine had a church built there, working at it with his own hands, and it was consecrated Nov. 9, 324, under the title of St. Savior. This church was overthrown by an earthquake in 896, rebuilt by Sergius III. (904-'11), dedicated to St. John the Baptist in 1114, and decorated afterward by Giotto; but it was destroyed by fire in 1308, and rebuilt to be burned down again in 1360. Urban V. restored it in 1364; it was afterward altered, enlarged, mutilated, and embellished under various pontiffs, till it was completely modernized in 1559. As it now exists, this basilica is 408 ft. long, with five aisles of equal elevation, and a flat ceiling profusely and tastelessly decorated by Borro-mini. The principal front, constructed by Alessandro Galilei in 1734, is considered the finest in Rome. The portico is 33 ft. deep and 174 ft. wide. The central entrance is ornamented with two bronze doors said to have belonged to the ancient temple of Saturn. Above it is the balcony from which the pope gives his solemn benediction on great festivals. To the right of the portico is the porta santa, opened only in the year of jubilee; and to the left is a statue of Constantine discovered in the ruins of the Thermae. This church has always been considered the cathedral of the bishops of Rome, and the central seat of their jurisdiction; it therefore takes precedence of all other churches in Rome and the Catholic world. The chapter of St. John Lateran, in like manner, takes precedence over that of St. Peter's. Every pope is crowned there, as in his proper seat. Over the west front is the inscription, Sacrosancta Lateranensis ecclesia, omnium urhis et orbis ecclesiarum mater et caput. The wooden table on which St. Peter, according to tradition, celebrated mass in the house of the senator Pudens, is enclosed in the high altar, on which no one but the pope is allowed to celebrate; and there, too, as is believed by Catholics, are enshrined the heads of Sts. Peter and Paul. Five general councils have been held under its roof. Adjoining the basilica during the middle ages were a monastery of canons regular and a celebrated school; the beautiful 12th century cloisters of the monastery are still in existence. Near them is the baptistery, or church of San Giovanni in Fonte, said to have been erected by Constantine, but more probably by Sixtus III. (432-'40). In front of the basilica is the largest known monolith, an obelisk of red granite covered with hieroglyphs, 150 ft. high with its pedestal, raised in memory of Thothmes IV., brought from Heliopolis to Alexandria by Constantine, and thence to Rome by Constantius. Church and Palace of the Lateran.